The purpose of this paper is to show the efficiency, in terms of energy, of the ancient mills’ infrastructures composed by little dams, channels and mills, working as a stairs of hydropower systems in the Relleu municipality, Alacant province, Spain. A very big difference among the efficiency of the ancient systems and the technology of today has been found. It is difficult to find money to retrofit the old infrastructures because the possible profits obtained will not be enough to recover the costs incurred, even considering the benefits derived from the upholding of the industrial heritage, an immaterial and intangible asset. In past times, conditions of technology, building, living and economy were very different than today and it was possible to invest time, money and workforce in building and using old hydropower facilities. The remains of this industrial heritage are there to show how difficult is to evaluate the profitability of an investment depending on changing circumstances. The number of water mills and where they were built depended on the vicinity of the population to be served and on the fields where cereals were produced as well as on the availability of flowing water and the related climatic and topographic conditions. That happened between 500 and 200 years ago, when citizens needed the approval of the aristocratic landowner to implement any initiative. to 130 mm, as it is said that in this country “rain don’t know how to fall”. Evapotranspiration is around 700 mm/year, bigger than rainfall. Due to the need to regulate water flows for irrigation, mill wheat and other cereals, important series of infrastructures were built in the neighbourhood of the village, comprising channels, mills, reservoirs and dams. Very likely, the first mill built was the Molí Vell (Old Mill), erected not far from the actual village of Relleu. The remains of the Molí Vell are in a place where water flow and water fall used to be enough to power the mill, constructed with very few civil works and reduced investment. Not far away, upstream the river, there are two other mills, La Tosca de Dalt and La Tosca de Baix (Upper and Lower Tosca), where the Amadorio’s flow rate increases because water coming from the Tosca spring is added to the flow. 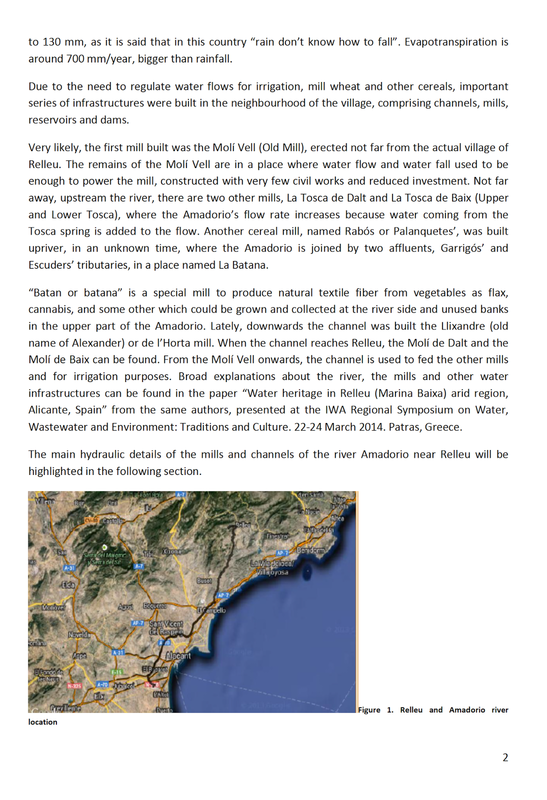 Another cereal mill, named Rabós or Palanquetes’, was built upriver, in an unknown time, where the Amadorio is joined by two affluents, Garrigós’ and Escuders’ tributaries, in a place named La Batana. “Batan or batana” is a special mill to produce natural textile fiber from vegetables as flax, cannabis, and some other which could be grown and collected at the river side and unused banks in the upper part of the Amadorio. Lately, downwards the channel was built the Llixandre (old name of Alexander) or de l’Horta mill. When the channel reaches Relleu, the Molí de Dalt and the Molí de Baix can be found. From the Molí Vell onwards, the channel is used to fed the other mills and for irrigation purposes. Broad explanations about the river, the mills and other water infrastructures can be found in the paper “Water heritage in Relleu (Marina Baixa) arid region, Alicante, Spain” from the same authors, presented at the IWA Regional Symposium on Water, Wastewater and Environment: Traditions and Culture. 22-24 March 2014. Patras, Greece. The main hydraulic details of the mills and channels of the river Amadorio near Relleu will be highlighted in the following section. The river Amadorio starts in the skirts of Aitana’s Mountains which stop the clouds coming from the Iberian peninsula in such a way that a climatic border is created. In the north side of the mountains the average rainfall is more than 700 mm while in the south side only 300 mm are registered at the head of the Amadorio’s river catchment and, along the river rainfall decreases quickly to 150 mm at the Mediterranean seaside. The rainfall is present mainly during September and October and the river base flow stands until April, May or June depending on the part of the precipitation which is in form of snow and on the intensity of the rain (intensities bigger than 150 mm/h have been registered). Because rainfall is decreasing along the river path and because water is extracted from the river for other purposes until it becomes dry, enough flow rates to power mills are nowadays present only in the upper part of the catchment, where the mills are located. Figure 2. 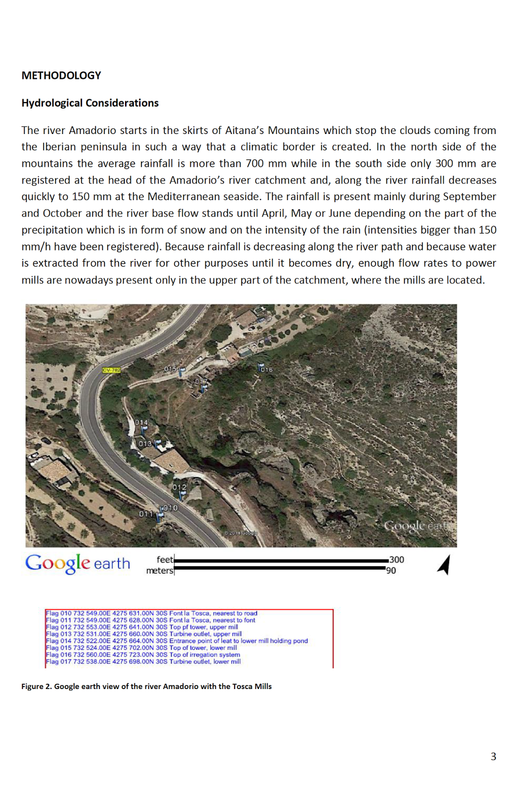 Google earth view of the river Amadorio with the Tosca Mills. The work basis have been Google Earth, Google Maps, Simpac (from the Spanish Central Administration), Terrasit (belonging to the Generalitat Valenciana Autonomous Administration) and the Topographic Map of the City Hall of Relleu or TMCHR. Google Earth and the TMCHR have been very useful. A GPS in each mill has to be used to locate its components in the map. The levels from the GPS cannot be used because they are too inaccurate, so the average error on the GPS that was 7 m east-west and 9 m north-south was corrected and the positions were fixed more accurately (Figure 2). Once the position has been fixed we used the TMCHR to obtain the level of each point. 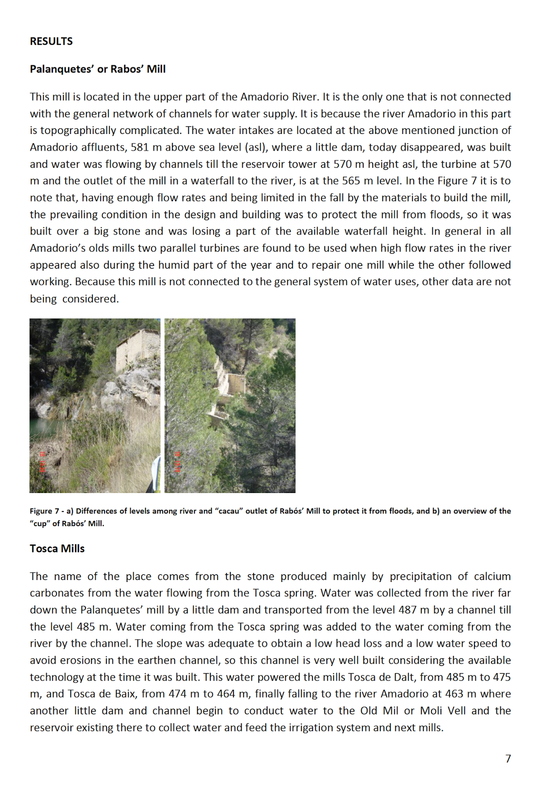 The data about head and water level are approximate to the real one, not exactly known, and could be cleared depending of further and more precise topographical works. 10 m of hydraulic head in each mill is assumed. To generate power, water was derived from the river and reached the mill by a little channel towards the “balsa” or water reservoir/pond of the mill. The “balsa” was connected with the tower or chimney, named “pou” or “cup”. At the basis of the tower it is a cave (the “cacau”), where the exit of water from the tower (the segitia or sagetia) is found. The exit is controlled by a wooden vane (the “morrera”) which, when open, forms a jet that impacts on the blades of the turbine. The turbine has an axis made of wood or iron called “arbre” (tree) if made on wood and “palaferro” if made on iron. The shape of the tower is like a ziggurat of three or four levels. The tower wall is made of stones. The thickness of the wall is larger on the base and smaller on the top. Thickness is the appropriate to support the strength generated by the hydrostatic water pressure. The tower is around 10 or 11 m high. Turbines (wheels) are located at the open air, so when examining the blades the system is similar to a Francis turbine, but they work as a reaction one or a Pelton type. At the beginning, turbines were made of pine green wood (Figure 3 a). The resin of pine waterproofs wood and then the turbine became nearly eternal. Turbines on wood were substituted by iron ones (Figure 3 b) because the energetic efficiency of the iron turbines was higher than the one from turbines made on wood. 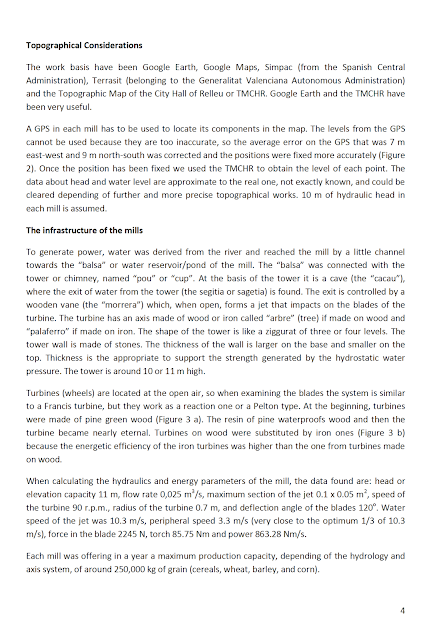 When calculating the hydraulics and energy parameters of the mill, the data found are: head or elevation capacity 11 m, flow rate 0,025 m3/s, maximum section of the jet 0.1 x 0.05 m2, speed of the turbine 90 r.p.m., radius of the turbine 0.7 m, and deflection angle of the blades 120o. Water speed of the jet was 10.3 m/s, peripheral speed 3.3 m/s (very close to the optimum 1/3 of 10.3 m/s), force in the blade 2245 N, torch 85.75 Nm and power 863.28 Nm/s. Each mill was offering in a year a maximum production capacity, depending of the hydrology and axis system, of around 250,000 kg of grain (cereals, wheat, barley, and corn). The description of non-hydraulic machinery as filters or mill stones is not presented here. 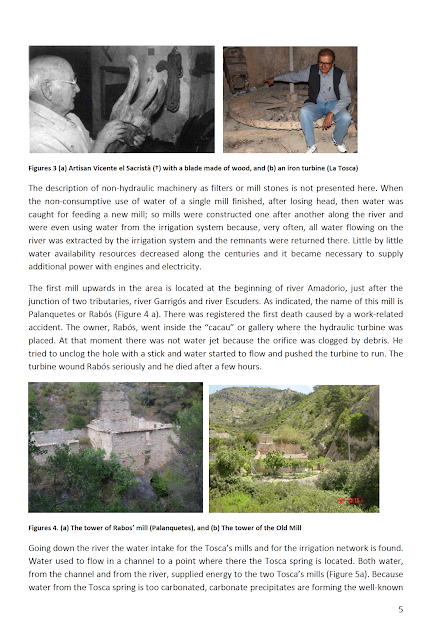 When the non-consumptive use of water of a single mill finished, after losing head, then water was caught for feeding a new mill; so mills were constructed one after another along the river and were even using water from the irrigation system because, very often, all water flowing on the river was extracted by the irrigation system and the remnants were returned there. Little by little water availability resources decreased along the centuries and it became necessary to supply additional power with engines and electricity. The first mill upwards in the area is located at the beginning of river Amadorio, just after the junction of two tributaries, river Garrigós and river Escuders. As indicated, the name of this mill is Palanquetes or Rabós (Figure 4 a). There was registered the first death caused by a work-related accident. The owner, Rabós, went inside the “cacau” or gallery where the hydraulic turbine was placed. At that moment there was not water jet because the orifice was clogged by debris. He tried to unclog the hole with a stick and water started to flow and pushed the turbine to run. The turbine wound Rabós seriously and he died after a few hours. Tosca’s stone. A beautiful Tosca’s stone’ can be seen in place. At the beginning of 20th century there was an unsuccessful project to use both water sources to generate electricity (Figure 5b). Water goes further on; flowing by the system, river and channel, and arrives to the Old Mill, which is more than 400 years old. There are documents indicating that the first Molí Vell used to pay taxes to the landlord in the Middle Ages. There is another story about the Molí Vell. A daughter killed his father making the hydraulic turbine start while dad was repairing the machinery. This was the revenge for an incestuous behavior (Soler, circa 1800 and Contestanos, 2010, Sendra, 1969). 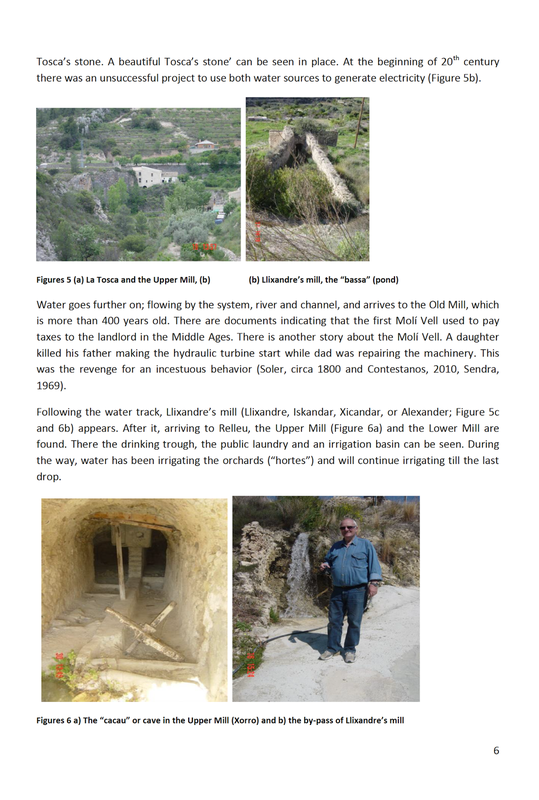 Following the water track, Llixandre’s mill (Llixandre, Iskandar, Xicandar, or Alexander; Figure 5c and 6b) appears. After it, arriving to Relleu, the Upper Mill (Figure 6a) and the Lower Mill are found. There the drinking trough, the public laundry and an irrigation basin can be seen. During the way, water has been irrigating the orchards (“hortes”) and will continue irrigating till the last drop. This mill is located in the upper part of the Amadorio River. It is the only one that is not connected with the general network of channels for water supply. It is because the river Amadorio in this part is topographically complicated. The water intakes are located at the above mentioned junction of Amadorio affluents, 581 m above sea level (asl), where a little dam, today disappeared, was built and water was flowing by channels till the reservoir tower at 570 m height asl, the turbine at 570 m and the outlet of the mill in a waterfall to the river, is at the 565 m level. In the Figure 7 it is to note that, having enough flow rates and being limited in the fall by the materials to build the mill, the prevailing condition in the design and building was to protect the mill from floods, so it was built over a big stone and was losing a part of the available waterfall height. In general in all Amadorio’s olds mills two parallel turbines are found to be used when high flow rates in the river appeared also during the humid part of the year and to repair one mill while the other followed working. Because this mill is not connected to the general system of water uses, other data are not being considered. Figure 7 - a) Differences of levels among river and “cacau” outlet of Rabós’ Mill to protect it from floods, and b) an overview of the “cup” of Rabós’ Mill. The name of the place comes from the stone produced mainly by precipitation of calcium carbonates from the water flowing from the Tosca spring. Water was collected from the river far down the Palanquetes’ mill by a little dam and transported from the level 487 m by a channel till the level 485 m. Water coming from the Tosca spring was added to the water coming from the river by the channel. The slope was adequate to obtain a low head loss and a low water speed to avoid erosions in the earthen channel, so this channel is very well built considering the available technology at the time it was built. This water powered the mills Tosca de Dalt, from 485 m to 475 m, and Tosca de Baix, from 474 m to 464 m, finally falling to the river Amadorio at 463 m where another little dam and channel begin to conduct water to the Old Mil or Moli Vell and the reservoir existing there to collect water and feed the irrigation system and next mills. Water can go by a channel directly to the Old Mill at 460 m in the tower and 450 in the turbine. Water also should go to a bassa (reservoir) for irrigation purposes. Both facilities break the piezometric water line, in one case to power the mill. Water from 449 m follows its way by another channel till the next mill, the Llixandre, at 443 m.
The slope of the channel from Tosca Mill to Old Mill is very efficient for transporting water. One of the characteristics of this channel is that water from it is used both to irrigate and for the next mill. The next mill will receive less flow than the previous ones. The level at the water arrival is 443 m and then passes to one or two turbines at 433 m. Water follows the path of the irrigation channel before entering the Molí de Dalt (Upper Mill). Water flows from the Molí de Dalt (434 to 426 m) to the Molí de Baix (425 to 415 m) or bypass the first one to feed the drinking trough and the public laundry, ending in the reservoir, 425 m, of the major irrigation system placed in the middle of both mills. 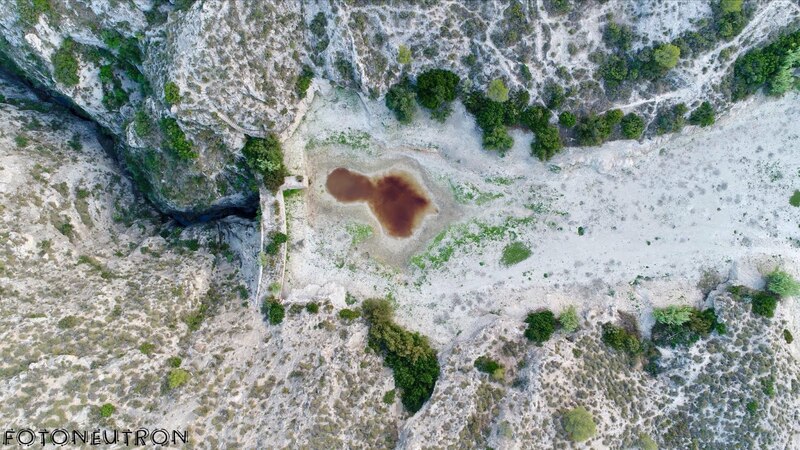 Perhaps after Moli de Baix in the old times the use of water power followed at lower levels of the river, because at this point the bed of the river is at 400 m, and the remains of an old olive mill can be seen just under the Molí de Baix in the river bed of a tributary of the Amadorio, called Barranc del Alcavo (tunnel), and in the Casa de l’Escrivà or the ancient Casa de l’Hort (the site of arqueological water studies) there is and arch that reminds the “cacau” were turbines used to work. The ancient river bed was transformed in a tunnel and over the tunnel an orchard was installed. When years passed by milling was decreasing little by little near Relleu. 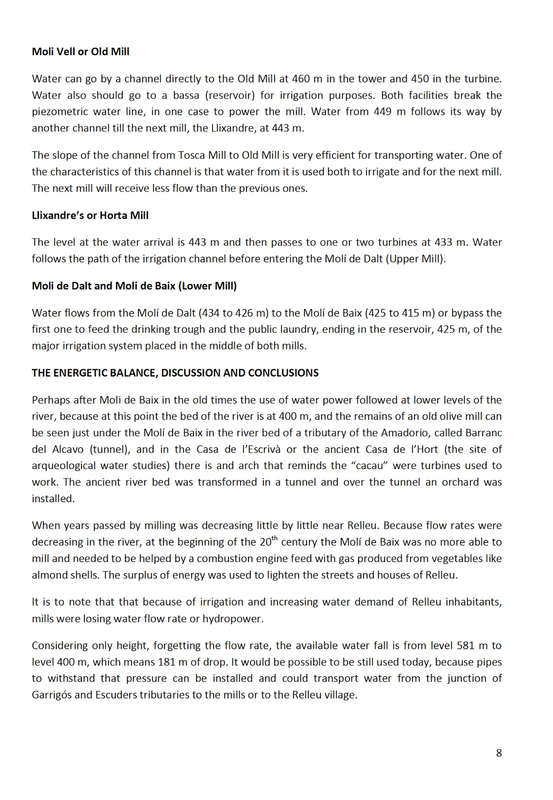 Because flow rates were decreasing in the river, at the beginning of the 20th century the Molí de Baix was no more able to mill and needed to be helped by a combustion engine feed with gas produced from vegetables like almond shells. The surplus of energy was used to lighten the streets and houses of Relleu. 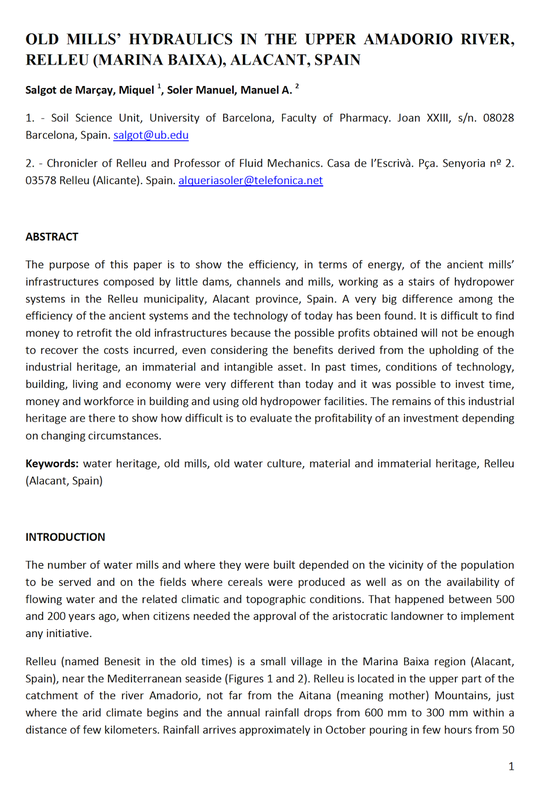 It is to note that that because of irrigation and increasing water demand of Relleu inhabitants, mills were losing water flow rate or hydropower. Considering only height, forgetting the flow rate, the available water fall is from level 581 m to level 400 m, which means 181 m of drop. It would be possible to be still used today, because pipes to withstand that pressure can be installed and could transport water from the junction of Garrigós and Escuders tributaries to the mills or to the Relleu village. The seven mills “used” approximately 70 m of the 181 theoretically available. In fact, in old times it was possible to use the available fall of Rabos’ mill, 10 m and the fall from level 487 to 400 m, in total 97 m, but not the fall between Rabós 565 m and the little dam feeding Tosca (at 487 m) because the works should have been very expensive and difficult at that time. 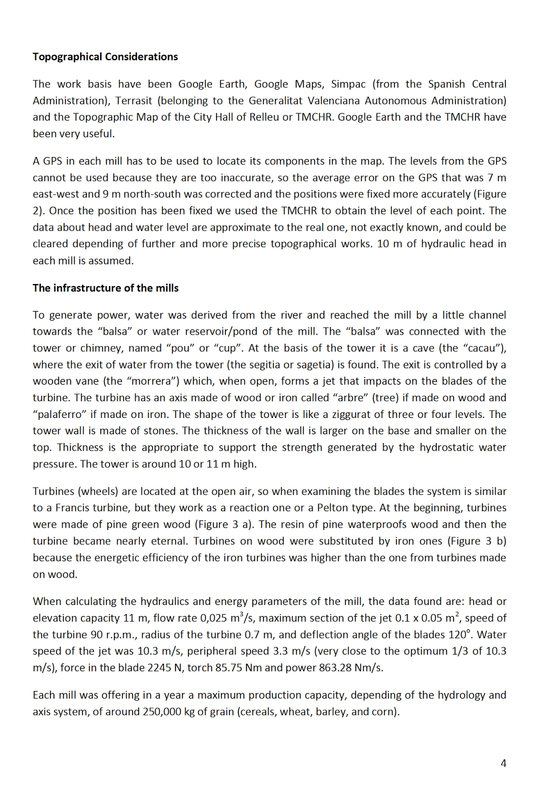 The project of introducing a hydropower system in the Tosca was not interesting for the mills because the available fall was practically the same. The only interest was to transform hydropower into electric power, energy of better quality. In case of implementing a pipe from Rabós’ mill to the Molí Vell, the water drop is 121 m, very interesting from the energy point of view. 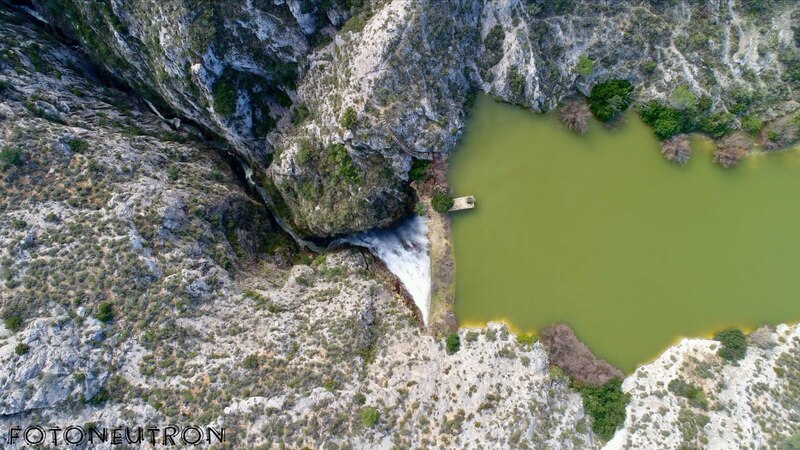 To try to use the entire fall is not convenient to produce electricity and the fall from the Molí Vell should be used for generating pressure to commit a new irrigation system in the area. The present hydraulic techniques under pressure as pipes and valves or for a free hydraulic surface can be attractive from the economic point of view, but it was not the same in former times when the infrastructures were built using work force (man or animals). Barciela, C.; López, M.I. ; Melgarejo, J. (2013). Los bienes culturales y su aportación al desarrollo sostenible (Cultural heritage and its contribution to sustainable development). Publicaciones de la Universidad de Alicante, Alicante, Spain. Fontana, G.I. ; Melgarejo, J.; Zardoya, M.V. (2012). Patrimonio hidráulico, industrial arquitectónico y urbano en el ámbito hispano-cubano. Colección Historia, Economía, Territorio. Climent, J, F. Recursos turisticos de Relleu (2013). Intermediated paper in a research work. Oral stories collected by the authors. 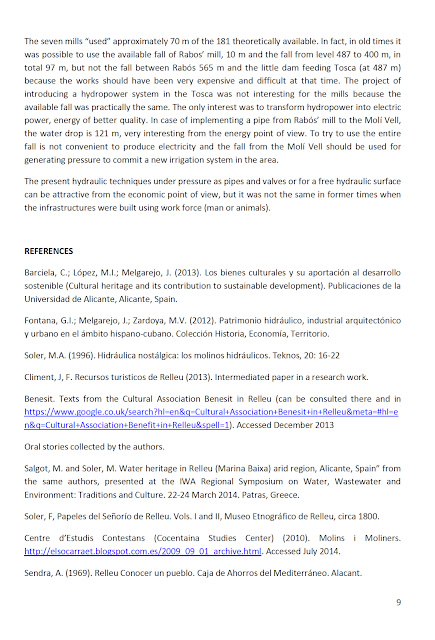 Salgot, M. and Soler, M. Water heritage in Relleu (Marina Baixa) arid region, Alicante, Spain” from the same authors, presented at the IWA Regional Symposium on Water, Wastewater and Environment: Traditions and Culture. 22-24 March 2014. Patras, Greece. Soler, F, Papeles del Señorío de Relleu. Vols. I and II, Museo Etnográfico de Relleu, circa 1800. Centre d’Estudis Contestans (Cocentaina Studies Center) (2010). Molins i Moliners. http://elsocarraet.blogspot.com.es/2009_09_01_archive.html. Accessed July 2014. Sendra, A. (1969). Relleu Conocer un pueblo. Caja de Ahorros del Mediterráneo. Alacant. PANTÀ DE RELLEU-s.XVII-XVIII_ BIC 2018. 20170130V-RELLEU-El Pantano (Pantà-Embalse) -¡¡¡SOCORRO!!! x Fotoneutrón.Foto de Enero 2017. 20170130V-RELLEU-El Pantano (Pantà-Embalse) -¡¡¡SOCORRO!!! x Fotoneutrón.Foto a Octubre 2017. El Panta de Relleu, pel Barranc. 20171031VideoHD-RELLEU-El Pantano (Pantà-Embalse) -¡¡¡SOCORRO!!! x Fotoneutrón.Foto Comparación de Enero a Octubre 2017. 20170528-Relleu-Breve Història del Pantano de Relleu x Roberto Mialles Seguí. 20170507-BIC pantano de Relleu Colegio de Ingenieos de Caminos, Canales y Pertos de Alicante - Mayo 2017 x Manolo Soler. 20170510-Relleu-Auntament-PANTANO-Proyecto paisajistico y mediambiental del Pantano de Relleu. 20170324-RELLEU.PANTÀ-_PaperID_58_Prevention of flood episodes al Relleu_22a24.03.2017xJFCliment-MASoler-MSalgot_10pags. 20170322-EVALUACION DEL ESTADO DE LA ANTIGUA PRESA DE RELLEU, PERPECTIVAS FUTURAS - versión en español. 20170130V-Relleu-El Pantano -x Fotoneutrón.Gener 2017. 20170127V-Relleu-Embalse de Relleu-LLENO-1 minut. x Fran Mercader. 20170201V-Relleu-De Relleu a Orxeta por el camino más guapo. 20110317V-Relleu-Barranco de Relleu x BenidormAventuras_a17/03/2011. 20091009V-Relleu-EL BARRANCO DE RELLEU-(8/10/2009) xMiguelAngel. 20170118-RELLEU-EL PANTÀ _ Foto x Mari Carmen Font. el 18/01/2017. 20160628-RELLEU-PLENO ORDINARIO ; EL 01 JULIO 2016-Ayuntamiento Relleu-Salon de Actos. 20160429-RELLEU-Pantano Relleu-BIC? - Escrit per par del PSOE de Relleu. el 29 d'abril 2016. 20160426-CARTA de MANUEL PINTO BALDÓ _(Ruta Morisca) a Relleu- *El Pantà*. 20160424-Fotos-EXCURSIÓ AL PANTÀ DE RELLEU el 24/04/2016. 20160423-INVITACIÓ A LA CONFERÈNCIA - LA PRESA DE RELLEU(s.XVII).Referència del Patrimonio Hidràulic. 20160423E-*R E L L E U* JORNADAS Y CONFERENCIA COLOQUIO LA PRESA DE RELLEU, REFERENCIA INTERNACIONAL DEL PATRIMONIO HIDRÁULICO DEL SURESTE PENINSULAR. *PANTÀ DE RELLEU* S.XVII i XVII *PANTANO DE RELLEU* ****BIC*****? 20160423-RELLEU A 23 DE ABRIL DE 2016- 19:00H -PRESENTACION LIBRO: Entorno de la Marina Baixa, y el proyecto en Relleu y en la Marina Baixa. 20160119S-RELLEU-EL PANTÀ_ Entrevista a Joaquín Melgarejo. 20141226-PacoMacia.blogspot.com - EL PANTANO DE RELLEU. UN REPASO A SU HISTÒRIA. 20140310-MasAllaDeLaCiudad.Blogspot.Com -PANTANO DE RELLEU(Alicante). por Fran Mercader. 20080219-ElPaís.com - Relleu-Un pantano sin dueño. 20171031V-RELLEU-El Pantano (Pantà-Embalse) -¡¡¡SOCORRO!!! Foto Comparación de Enero a Octubre 2017.-#RESCATEMELPATADERELLEU. 20170118-RELLEU-EL PANTÀ _ 18 de Gener de 2017. S.XVI i XVII - Interés Turístic Cultural PANTANO DE RELLEU - PANTÀ DE RELLEU - *S.XVI-XVII* - http://relleupantano.blogspot.com.es: PRIMERA PRESA EN ARCO DE EUROPA EN LA ÉPOCA MODERNA. EJECUTADA EN SILLERIA EN SUS PARÁMETROS AGUAS ARRIBA Y AGUAS ABAJO. HISTORIA Y DETALLES CONSTRUCTIVOS. TORRE DE CONTROL DE DESAGÜE. VISTA A LA HOZ DEL AMADORIO Ó "ESTRET DEL PANTANO". CASETA DEL GUARDA. PRESA Y CANAL AUXILIAR. FAUNA Y BOTÁNICA DEL LUGAR. PANTÀ DE RELLEU-Solicitut BIC "Bé Interés Cultural" S.XVI.XVII._2016 -Blogeer GRATUIT--. Tema Sencillo. Con la tecnología de Blogger.